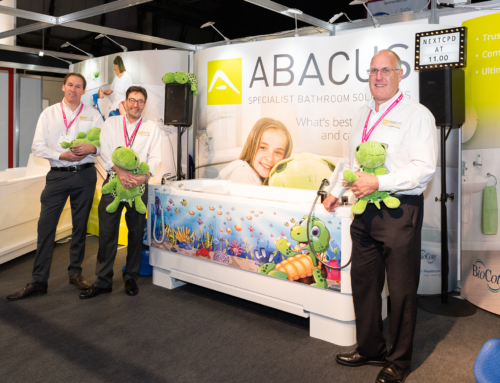 We showcased examples of our bath range at Kidz-to-Adultz-Middle and offered a free prize draw to win a cuddly toy of its new Mascot, Trevor the Turtle. The Kidz series of shows provides an opportunity for families and therapists to see and compare the latest products and services that offer greater independence and comfort for individuals living with restricted mobility. Stacie and his mother Michelle regularly attend the Kidz-to-Adultz-Middle exhibition so they are aware of the latest equipment available for easier day-to-day living. They are currently seeking funding for an accessible bath as Stacie has to be sprayed in their wet room on a floor-based reclining shower chair. He is then carried to a bedroom for drying. This is potentially unsafe and not pleasant for Stacie but is the only solution as Michelle cannot lift him in and out of their standard bath which would pose even more risks. Stacie and Michelle both visited the Abacus Healthcare stand and received a demonstration of the Gemini bath from our specialist product advisors on hand during the show. The Gemini powered bath has a ‘double lift’ action and integrated changing, drying and bathing platform which eliminates the need to manually lower and lift a bather. This solution means that parents and carers can avoid excessive bending and potential back injury whilst the bather is more comfort and safe. Michelle was keen to understand more about the Gemini as she currently has to bath Stacie in a standard bath which is very challenging. For your chance to visit #TrevortheTurtle we’ll see you at Kidz to Adultz South in June!